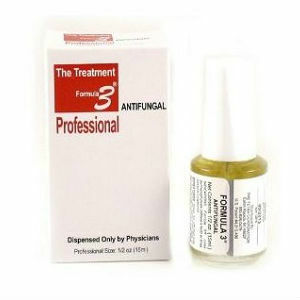 Formula 3 Antifungal is an effective treatment for athlete’s foot and ringworm. It contains FDA-approved ingredients and is dispensed only by Physicians. The Tetra Corporation, who owns the trademark for Formula 3, prohibits the sale of the product on the Internet. It comes in a plain white box with some red lettering; the bottle itself has a black lid and white label. Formula 3 Antifungal is a brush-on solution and looks much like a nail polish, though it contains ingredients that promise to treat fungal infections. To find out more I looked into what Formula 3 Antifungal has to offer to athlete’s foot and ringworm sufferers. Formula 3 Antifungal has received the American Podiatric Medical Association’s Seal of Approval. Formula 3 Antifungal has a three-step process. First, users must clean the affected area and dry thoroughly, paying special attention to spaces between the toes. Second, users should apply a thin layer of the product over the affected area twice daily (morning and night). This will allow Formula 3 Antifungal to penetrate the tissue and reach the fungal growth area. Third, you should remember to change your shoes and socks at least twice daily (or whenever your feet get wet or damp). This will make sure the product works as it is supposed to. If you are pregnant or suffer from allergies you should consult a health care professional before using Formula 3 Antifungal. Though the website states that the sale of Formula 3 Antifungal is prohibited on the Internet I was able to find an old listing for it on Amazon.com. Though it was currently unavailable, one customer said they paid around $40 for one bottle. The official website states that one bottle of Formula 3 Antifungal will typically last somewhere between 3 and 6 months, which I think makes it a great value. Yes. When you purchase Formula 3 Antifungal at your Physician’s office it is backed by an unconditional, patient-direct, money back guarantee. Their website also had several glowing reviews for Formula 3 Antifungal, which is a great sign for people looking to ask their Physician more about the product. The Amazon.com listing for the product (which is now unavailable) had 13 reviews and a 4/5 star overall rating, which is another positive sign. Formula 3 Antifungal is a product used to cure athlete’s foot and ringworm. It contains an active ingredient to solve the problem. The application process is straight forward and easy to follow for anyone. Unfortunately for some Formula 3 Antifungal is only available from Physicians so it may cost more than the average fungal treatment, as users would need to pay for a visit to their doctor and then also purchase Formula 3 Antifungal. One bottle of Formula 3 Antifungal will last 3 to 6 months, which is a long time. Formula 3 Antifungal is also guaranteed when you buy it at the Physician’s office, which is reassuring. Jack Stevens	reviewed Formula 3 Antifungal Treatment Review	on March 8th	 and gave it a rating of 3.5.